Time to Play: 2 Min. It's Faster Than You Think! 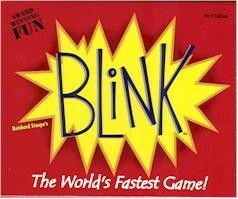 Blink is the lightening fast game where two players race to be the first to play all of their cards. Using sharp eyes and fast hands, quickly try to match the shape, count, or color on the cards. Be the first player out of cards, and win!